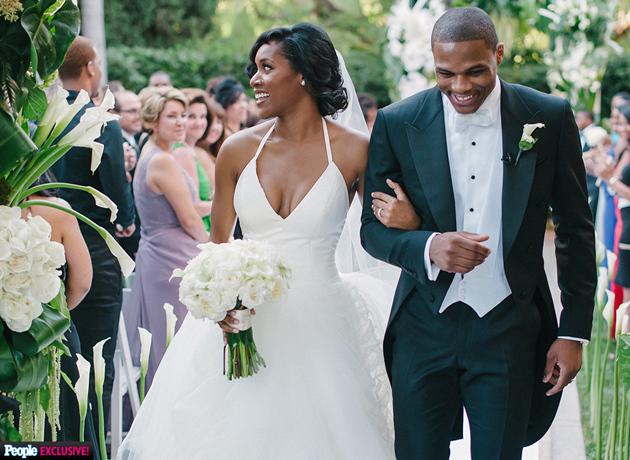 Russell Westbrook married his college sweetheart Nina Earl. Russell Westbrook married his college sweetheart Nina Earl over the weekend, according to our friends over at People. Westbrook and Earl met when they both played basketball at UCLA. They married in Beverly Hills. And as you would expect for an NBA superstar's wedding in the shadow of Hollywood, the ceremony was filled with big names. Oklahoma City Thunder teammates Kevin Durant and Serge Ibaka were in the house. So was former Thunder teammate James Harden, who brought Khloe Kardashian as his plus-one. Also in attendance was Keri Hilson, and pop star Miguel gave a surprise performance later in the evening. Westbrook, who probably recorded a triple double while walking up to the altar, will celebrate his wedding anniversary one day before another famous pair—Dwyane Wade and Gabrielle Union.